This popular Barcelona day trip, a private Montserrat tour, offers a spiritual experience in a scenic setting just an hour outside bustling Barcelona. You will enjoy the scenic drive on winding roads via private transportation to reach Montserrat Hill, a stunning rugged mountain with a monastery nestled at its foot. The site has been a place of worship since antiquity, when the ancient Romans built a temple to the goddess Venus here. Formally founded at the beginning of the 11th century, the Santa María Benedictine monastery is still a functioning monastery today, so only its Basilica is open to visitors. In your Montserrat tour, you will see of the Basilica, which features a shrine to Our Lady of Montserrat — “La Moreneta” (the Black Madonna), as she is affectionately known as all over Catalonia. Depictions of the Black Madonna are one of Christian Europe’s great mysteries, as their origins and meaning have been lost over time. Today, the Basilica also houses a museum with masterpieces by many prominent artists, including El Greco, Dalí and Picasso. 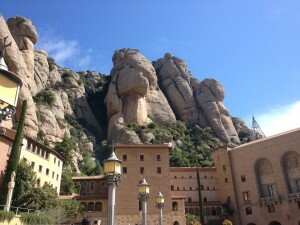 The Montserrat Hill is an important pilgrimage site for the Catalans, who flock there by the thousands on various occasions throughout the year to venerate La Moreneta, and spend the day outdoors in a spectacular site.